Amazing fish swims under water by remote control. 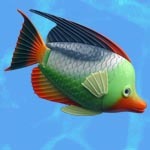 It swims like a real fish by moving its tail back and forth. 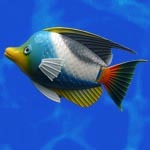 The tail is flexible rubber and duplicates the wave-like action of a real fish tail. Steering too is accomplished by moving the tail in a lifelike manner. There are no hidden propellers. The 10" fish comes fully assembled with controller. If you have both designs, you can operate them both at the same time. Imagine how fun it would be to have races or underwater dogfights in your pool! Easy to operate and great for kids.